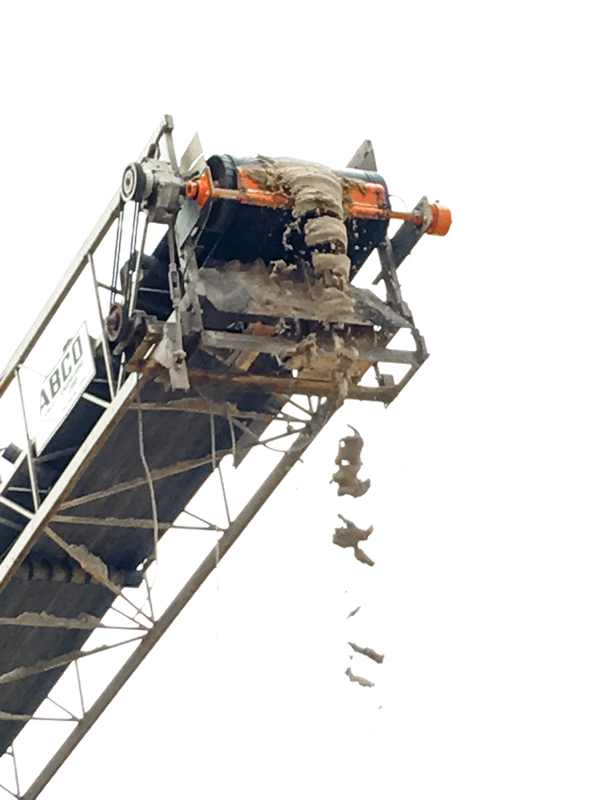 A Texas supplier of sand for ready-mix concrete and masonry applications is among the first companies to register its conveyor belt cleaners via a new mobile app, taking advantage of a factory-direct replacement program that guarantees fresh polyurethane scraper blades, specified and custom-fitted on-site and installed free of charge. Image Materials will benefit through a consistent supply of freshly-molded, high-quality blades -- each labeled with a date of manufacture -- delivered directly from the factory and installed by a trained service technician. The new “Mr. Blade” program from Martin Engineering assures customers of professionally installed replacement blades that are matched to their specific operating conditions, providing optimum cleaning performance and service life. The dredged sand is first brought to the classification tank to size the particles. Coarse particles are separated out for concrete, while finer sand is sold for masonry applications. The facility has four conveyors at this location to move material from the sand screw discharge and eventually to the stockpiles, where it awaits loading onto customer trucks for transport. Proffitt said that the cleaners used in the company’s other location didn’t last as long as expected, and they failed to deliver consistent cleaning throughout the product’s service life. He estimated that ten hours a week are often spent on repairs and cleanup that can be directly attributed to carryback. Martin Engineering Service Technician Tyler Lisenby conducted a thorough inspection of the conveyor and belt cleaning system at the Alvord location, and he suggested a scraper blade engineered specifically for sand and gravel applications. Able to remove even wet, sticky sand from belts up to 72 inches (1800 mm) wide, the Martin® Pit Viper is a durable, one-piece blade that contains approximately 20 percent more urethane than comparable pre-cleaners, yielding a longer life in challenging service conditions. “The cleaning performance is excellent,” Proffitt continued. “And we decided to take advantage of the product registration for the peace of mind. The technician visits us once a month and inspects the cleaners, tensions or adjusts anything that needs it and helps us avoid breakdowns. As part of the new program, Martin will maintain an electronic record of operating conditions on all conveyors using its equipment. This data will be updated regularly, providing management with an operational assessment of vital components, including recommendations for avoiding costly failures and system downtime. Further, MSHA-certified Martin service technicians will adjust, repair or replace the main frame and tensioner of any belt cleaner at no charge. “Turning over responsibility for stocking, delivering, installing and maintaining belt cleaners can reduce maintenance demands on plant personnel, and product registration provides a lifetime record of all Martin belt cleaning equipment,” said Lisenby. Also included are regularly-scheduled inspections and blade replacement as required on all Martin® belt cleaning systems, as well as the company’s 18-point Walk-the-Belt audits emphasizing worldwide best practices. All services are covered in the blade pricing, with no contract required. Because the service component of the new program includes not only installation but also maintenance and adjustment, plant resources are freed up for core business activities. Consistent attention to the cleaners helps deliver maximum performance and wear life, minimizing component failures and unscheduled shutdowns. Emergency service will be available from MSHA certified technicians capable of servicing any brand or style of cleaner. The company will also supply retrofit blades to fit belt cleaners from any manufacturer.